In a letter to Henslow in March 1835 Darwin remarked that he had done ‘very little’ in zoology; the ‘only two novelties’ he added, almost as an afterthought, were a new mollusc and a ‘genus in the family Balanidæ’ – a barnacle – which ‘has not a true case, but lives in minute cavities in the shells of the Concholepas’. 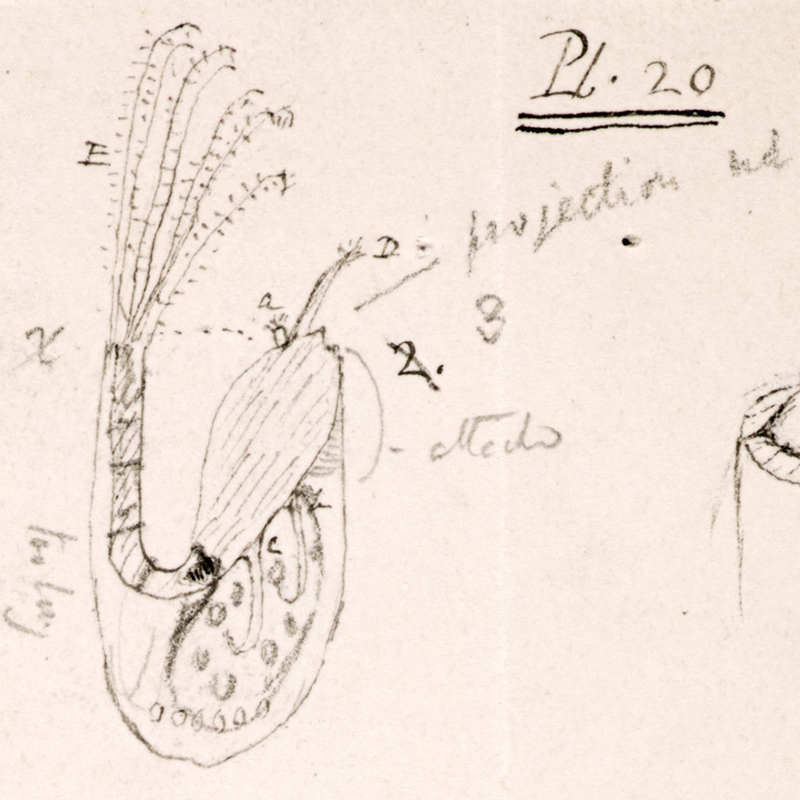 His notebook entry on this aberrant creature, later called Cryptophialus minutus, revealed that, in addition to its lack of shell, it possessed only three pairs of cirri – frond-like limbs used for gathering food – instead of six, and, observing its final pre-adult stage, he wondered ‘who would recognise a young Balanus in this ill-formed little monster?’ Darwin put his specimens away for over a decade, and when he returned to the puzzling little creature in October 1846, he planned only to write a paper on the anomalous ‘Mr Arthrobalanus’, as it was now known to him. But by the end of November he had asked Richard Owen for further specimens of sessile barnacles with which to compare it, and eventually, Darwin decided to write a complete monograph on both living and fossil Cirripedia. The work took him eight years. Barnacles are a very odd group of Crustacea. The crustaceans most of us probably know are lobsters and crabs; with an armour-plated body, multiple legs, and large pincer-like claws, a crab scuttling along the sand at low tide is easy to identify. A cluster of acorn barnacles, on the other hand, fixed to a rock and revealed at the same low tide, resembles a miniature volcanic mountain range extruded by the rock itself, and yet these odd creatures are the exo-skeleton in the closet of the crustacean family. Indeed, they remained in the closet until well into the 19th century. They were first placed along with molluscs in the Vermes (testacea) by Linnaeus (1758); Jean-Baptiste Lamarck, recognising some of their internal structural differences, called them ‘Cirrhipeda’, divided them into sessile and stalked, and made them an intermediate group between sedentary ‘Annelides’ and ‘Conchifera’ (1809), but Georges Cuvier, not admitting intermediate classes, soon returned them to his ‘Mollusca Cirrhopoda’ embranchement (1812). When Darwin sailed on the Beagle at the end of 1831, John Vaughan Thompson’s Zoological researches (1828–30), was one of the books on board. Thompson was the first to argue that cirripedes were true Crustacea, based on his observation of a larval stage of Balanus. Thompson’s view was by no means immediately accepted; the entry on ‘Cirripeda’ in the Penny cyclopaedia of 1837 reads, ‘a well-defined natural group of marine invertebrate animals, whose place in the system has occasioned much doubt and difference of opinion among zoologists’. How and why did Darwin become the person who would dispel much of that doubt and write the definitive taxonomic monograph on the sub-class Cirripedia? Darwin’s interest in marine invertebrates began while he was a student in Edinburgh. Instead of concentrating on his medical studies, he turned his mind to the fascinating world of sea creatures he could observe on the beach at Leith. His first paper, in March 1827, concerned his discovery that the ‘ova’ of the sea mat, Flustra, were ciliated and free-swimming. After recording this observation in his notebook, he added, ‘This fact although at first it may appear of little importance, yet by adducing one more to the already numerous examples will tend to generalise the law that the ova of all Zoophites enjoy spontaneous motion’. Darwin was already demonstrating two characteristic aspects of his research style: his acute observational skill and his mindfulness of the significance of single observations for theoretical generalisations. Taxonomy did not interest him for its own sake. By 1844, Darwin had produced only one small addition to taxonomic literature, based on specimens collected during the Beagle voyage: he described several new species of terrestrial Planaria that he had discovered mostly in Chile and Brazil. In the introduction, Darwin focused on the differences between these land-living flatworms and their better-known marine counterparts, and he also noted that many of their adaptations to life on land were analogous to those of terrestrial gastropods. He concluded that the ‘existence of terrestrial Planariæ is analogous to that of terrestrial leeches in the forests of southern Chile and Ceylon’. Although Darwin had not mentioned transmutation, the subtext of a transformist view is apparent. The diagnostic features are not mere structural descriptions, rather they relate to the adaptation of each species to a particular way of life. If Darwin was going to embark on a larger taxonomic work, it was evident that it would be a taxonomy underpinned by the idea that the relationships among taxa were, in fact, evidence of true genealogical relatedness. In his monograph, Darwin located the Cirripedia within the larger class of Crustacea and he located Cryptophialus minutus (the erstwhile ‘Mr Arthrobalanus’) within the Cirripedia. He demonstrated that a taxonomy that relied less on ideas about deviation from an ideal ‘type’ and more on the notion that structural changes were a response to changing ways of life could provide a system of classification that reflected material reality. This text is adapted from 'The anomalous "Mr Arthrobalanus": Darwin's adaptationist approach to taxonomy' by Shelley Innes (in Alison M. Pearn ed., A voyage round the world, Cambridge University Press 2009, pp. 74–6.